I know this isn’t exactly what Your View Today would look like from Addi’s perspective, but I wanted Addi still in the photo and you get the general idea. Addi’s view today was of trains, trains and more trains!! 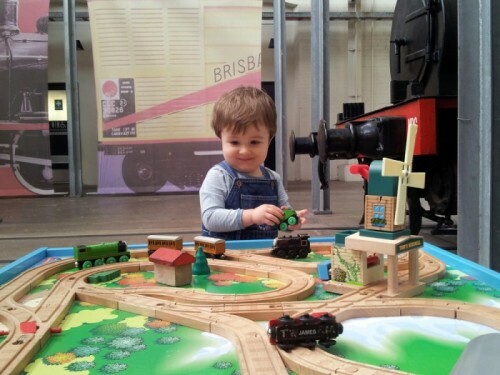 We were at the Workshops Rail Museum in Ipswich for a family outing. Hi. Melissa, I’m really loving these photos. And it’s amazing – I was remembering your prepurchased tickets for the museums and was thinking I wonder if you’re going to get back to the Workshop Museum again – and that’s what you were actuallly doing at the time! I’m glad you can all have some time together for a few days.